Keeping you and your family safe does not necessarily have to do with having the best gear. Self-defense knowledge and weapons are certainly helpful. A good security system can help you feel safer at home. However, one single most important skill that can save your life above any gear you may have is learning the Art of Situational Awareness. Not only can developing this skill help you in a disaster scenario, but also in your current daily life. Have You Heard of Situational Awareness? First of all, Situational Awareness is NOT about being paranoid with everything you see. It’s about being thoroughly aware. If you haven’t heard of this term yet, it basically means having a mentality of consistently evaluating your surroundings for potentially dangerous situations or threats to your safety. It is a training of your mind to recognize dangerous situations and having the common sense to do what you can to avert them. The best way to survive a disaster is to avoid it in the first place. Situational Awareness is more akin to having intuition that you add to your self-defense skills. It is an instinctual ability to feel that you are in a threatening situation, because of your observations. You’ve most likely had that feeling before that something just didn’t seem right. You may have “felt” the need to get out of a place or that an area wasn’t safe. Effective Situational Awareness is using your knowledge and intuition (I call this listening to the promptings from the Holy Ghost), to recognize a possible threat and act to keep yourself safe. A woman and her husband were camping in the woods by themselves. They had finished eating their campfire stew and were relaxing. As they were looking at the stars, they heard the breaking of a branch in the bushes nearby. It wasn’t anything considerably out of the ordinary since they were in the woods after all. It could easily have been an animal. Possibly a deer or even a bear. Not wanting to be confronted with a bear, her husband grabbed a big branch and threw it in the direction of the bushes where the sound came from. Typically, if it was a wild animal nearby, a branch being thrown in their direction would be enough to rattle the animal and send it running off. Yet, to his surprise, there were no more sounds after he threw the big branch. There was no noise of any animal running off. Instantly, this man new that something wasn’t right. His intuition kicked in here. He quietly told his wife to not ask any questions but to nonchalantly make her way to the car like she’s getting something for desert. She was a little freaked out at first, but she did precisely as he asked. Soon after, he slipped in the driver’s seat of the car and they drove away leaving all their camping supplies there. Her husband told her they would come and retrieve their gear in the morning, but felt they needed to get out of there soon. He didn’t know why, but he knew that something wasn’t right and that it wasn’t safe. Surprisingly, the following day while they watched the news, they saw a story of a band of armed men in that same vicinity where they were camping. These individuals had assaulted and robbed people who were camping there. Being AWARE of your SITUATION can save your life. It’s important to note in this example is that the husband’s instincts were based on OBSERVATION. He didn’t see anyone in the bushes, but a feeling inside him told him that is wasn’t safe to be where they were that night. Note – it wasn’t simply that he “felt” unsafe; but he used clues from his observations. He threw a branch, no noise came from it, which gave him needed information about the situation. Then he listened to his instincts and made a decision to get out of there quickly. The Normalcy Bias is state where a person either does not see danger or minimizes/underestimates danger and thus does not act in a way to protect himself or those around him. When people are in the Normalcy Bias, they fail to prepare for impeding disasters or to recognize possible danger. Many lives have been lost due to people and individuals being in the Normalcy Bias. Learn more how to recognize and overcome the Normalcy Bias in our other article here. It’s time to train your mind in the ART of Situational Awareness. It’s about thinking differently. Changing the way you think and look at your surroundings can keep you safe. Make it a habit to keep your head up as you walk and looking around. Don’t look at your feet or your phone. With your head up, you can observe where you are going, what people are ahead of you, if anyone is around your vehicle, and see any potential threats in your vicinity. When you go to a restaurant or other public place, choose to sit where your face is towards the entrance (or area with the most action) and your back against the wall. This way, if someone comes in who might have threatening motives or dangerous body language – you will be able to see this. The best asset you have is your eyes so be sure they are always pointed towards the area where they can see any possible threats. When you go out to dinner or to the theater, park your car under the light. When it’s dark and you are returning to your vehicle, you will be less likely to be targeted for assault in an area that is lit up brightly. Whether walking, driving, biking or jogging – get into the habit of observing who is close around you. You will more easily notice if you are being followed if you are watching those around you. Perhaps you’ll note that a person in jeans and a brown hoodie keeps making the same turns you are. It’s possible that he is following you. If this happens, be sure to stay in a crowded / public area. You are less likely to be confronted where lots of people will witness. Keep a mental note of the person’s description or even snap a picture with your cell phone. Note people’s hands. Seeing their hands lets you know if they are holding something that might be a weapon or not. If someone is concealing something, they will often touch or pat that specific area of their body where it is concealed to make sure it is still there. Watch their hands. Be careful where you are driving. If you are following a GPS and it takes you through a shady area, find a different route. When unfamiliar with an area, do not drive down roads or alleys that are dimly lt. Remember, the chances of getting assaulted are much less if you don’t put yourself in situations where it can happen. A weak body language might make you a target. Walking slumped over, slowly, staring down at the ground or your phone can tell others that you are distracted and not confident. Walking with good posture, head up and looking around, giving eye contact to anyone staring at you will tells others that you are confident. Staring right back at a suspicious person looking at you shows them that you see them. You are a fighter. You will not back down. That is strong body language. In developing these habits, it’s important also to stay relaxed. A calm demeanor doesn’t bring unnecessary attention to oneself. Frantically looking around with a worried look on your face will make people notice and can also cause you to miss important details. When you are relaxed, it helps you remain focused and observe more information around you. 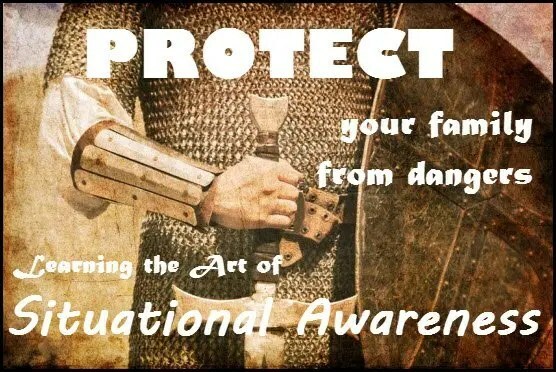 The purpose of practicing situational awareness is to avoid circumstances where you might have to rely solely on your ability to defend yourself. It is a mindset to cultivate until it is something you do without thinking. PRACTICE! — PRACTICE! — PRACTICE! It is much better to avert danger, than to fight for your life through it. It’s a good idea to share these things with your children. Help them to practice this art. Make it a game to talk about what you observe when you go out in public. Situational Awareness can help you refrain from making poor decisions and can save your life.